I have a DSLR PENTAX K20D, and Flash SIGMA EF 530 DG Super, V6 are compactible with this flash? If your EF-530 DG Super is for Nikon, then we are sure it is compatible as we have one in the studio. However if it is for other flash systems, we can't be sure as we have not tested it before. If your SIGMA flash indeed does not run on Nikon, but you are able to find out whether your flash has Analogue TTL, then it should be fine too. My flash is for PENTAX, system P-TTL. Judging from the date the flash is released, in 2010, it's very likely that it has analogue TTL. So it's very highly that it's compatible with the V6. Despite we don't have a flash profile for it, you may use one of the other existing flash profile with similar GN. I recently updated the firmware for 2 V6ii's and 1 V6. I shoot with a Pentax k-3ii and use a Pentax flash AF540FGZ II. Before turning to getting the V6 to work with the V6ii, I have tried to get the two V6ii's to work. I cannot get the power sync to work (I have not tried HSS). The power setting are transferred from the Cactus Tx to the Cactus Rx (I see these in the cactus panels) and the flash fires. But the power levels do not vary (ditto zoom changes). The flash is set to TTL and all function setting are at the defaults (I've trued other setting too). Both Tx and Rx show the Af540FGZ II flash. I am new to the Cactus system so I could be missing something simple. But it seems to me the Cactus is not communicating with the flash. What should I change or test? Are you letting the V6 II auto-detect the flash? If you are, be sure to first swtch on the flash, set it TTL mode, then switch on the V6 II to RX mode. On the other hand you may also manually selecting the flash profile on the RX unit. ... Both Tx and Rx show the Af540FGZ II flash. You don't need to set the flash profle on the TX mode if you are not mounting the AF540FGZ on-camera (on the V6 II TX unit). Thank you and let me know if the above helps! Unfortunately I still cannot get the V6ii's to adjust power. I have 1 V6ii mounted on camera set Tx. The flash is mounted on a second V6ii set Rx. The Tx V6 does communicate to the Rx V6 (both screen show power changes). The problem is the the Rx V6ii does not change the actual power output of the flash--altho the flash does fire. This applies to both TLL and manual setting on the flash. I really have tried all sorts of other combinations. I do not know what to do next. For HSS shots, I used F10, 1/1000s, ISO 100, and AF540FGZ-II mounted on the V6 II RX, manually selected the corresponding flash profile, "AF540F2". Then tried x-sync, shot at F13, 1.125s, ISO 100. For both sync modes above I was able to control the flash power output from 1/128 to 1/1. BTW, never set the flash to M mode. In order for the V6 II (or the V6) to fully communicate with the flash, it must be set to TTL mode. For those who are reading from the original post by Asamento, user was asking about the originall V6. But later on serialphoto asks about the V6 II. Just in case anyone gets confused. Forgot to post a photo of the gear i used for testing. 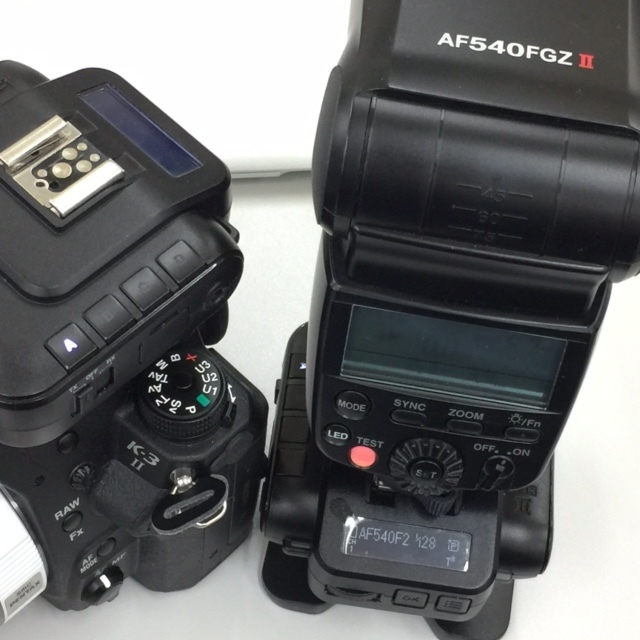 Apparently the 540 FGZ II needs to be put into "P-TTL HSS" mode (not just "P-TTL" mode) in order to support remote power level control. At least that's what serialphoto posted elsewhere. Just mentioning it in case it helps someone else. Thanks for pointing that out, Class A.